19 On the evening of that day, the first day of the week, the doors being shut where the disciples were, for fear of the Jews, Jesus came and stood among them and said to them, “Peace be with you.” 20 When he had said this, he showed them his hands and his side. Then the disciples were glad when they saw the Lord. “On the evening of that day, the first day of the week, the doors being shut where the disciples were, for fear of the Jews.” — It is Sunday evening, “the first day of the week”. Evening indicates the approach of darkness. In John’s Gospel, darkness is a sign of evil and lack of faith. The disciples had fled from Jesus when he was arrested in the Garden of Gethsemane and they still lacked faith and were afraid that they might also be arrested, even killed by the Jews for being followers from Galilee. It is important to remember that their thought had been that Jesus would establish a political kingdom and that they would be given important appointments. One of the disciples on the road to Emmaus stated that “our own hope had been that he would be the one to set Israel free” (Lk. 24: 21). It is not surprising that they had the doors shut because of their fears. The feast of Passover lasted a week and they would have been noticed going away from Jerusalem if they had headed off to Galilee. They had decided to remain in the “Upper Room” for the week and then mingle with the crowd on the return journey to Galilee. “Jesus came and stood among them and said to them, ‘Peace be with you.’” — Suddenly there was Jesus standing in their midst. He came through the closed door. We are not told the disciples’ reaction. Obviously they were speechless: Jesus that had been crucified and buried now among them, alive and talking, after coming through a closed door or wall! Immediately he addressed them to reassure them. “Peace be with you”, he greets them. “Peace” was the first word spoken by the risen Christ. It was the first fruit of the resurrection. This was the normal greeting of Jewish people. But it took on deeper and special meanings as uttered by Jesus in the Upper Room. A few days before this, as Jesus was taking his leave from his disciples, he had said to them, “Peace I leave with you; my peace I give to you; not as the world gives do I give to you. Let not your hearts be troubled, neither let them be afraid. You heard me say to you, ‘I go away, and I will come to you.’ If you loved me, you would have rejoiced, because I go to the Father; for the Father is greater than I. And now I have told you before it takes place, so that when it does take place, you may believe. (Jn. 14: 27–29). They had not understood then and even if they had their memories were clouded. Only with the coming of the Holy Spirit would they remember all that Jesus had said. “When he had said this, he showed them his hands and his side.” — There was no need for further proof or clarification. By his wounds they were reassured that this body in their midst was the same body that was crucified, whom they had known so well for years. His body is not limited by material surroundings — he entered the Upper Room twice when the door was shut (Jn 20: 19, 26). He is not a spirit but has a real body that can be touched, as Mary Magdalene touched him when they met (Jn. 20: 17). He could be seen and he could speak, as the present passage testifies. This real, risen body is one and the same as the body crucified; Jesus showed the wounds of the nails and the spear in his side to the disciples. Jesus could eat and drink. By the lake of Tiberius he fed the Apostles and he also ate (Lk. 24: 42–43). 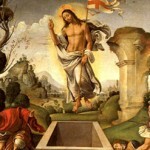 Jesus and his risen body belong to the Father’s realm (Jn. 20: 14, 17, 19, 20; 21: 4). He is not limited by space or time. His body can appear how, where and when he wills. Jesus can appear as a gardener, a fisherman or as he wishes (Jn. 20: 20: 14–16; 21: 4, 7). His body is not confined to earth nor was the resurrection a return to earthly life as were the bodies of Lazarus, the daughter of Jairus and the son of the widow of Nain, all three raised to life by Jesus during his earthly life. All three had to die again. Jesus’ risen body has passed from earthly life and then death to divine life which he shares equally with the Father and the Holy Spirit. In his First Letter the Evangelist John sums up the following qualities of the disciples (I Jn. 1: 1–4). “Then the disciples were glad when they saw the Lord.” — Here we see three qualities of the disciples. (i) The first was faith; they recognised him as “Lord”, the Son of God. (ii) The second was the “peace” enunciated by Jesus in his first words during his first appearance. Peace was the result of faith in the risen Lord. Peace was not only an effect of the resurrection, it was something the disciples had in knowing that Jesus’ words were trustworthy. “Jesus said to them again, ‘Peace be with you.’” — For the second time Jesus greeted the disciples with “Peace be with you”. His “peace” had special meanings. Already we saw its association with joy and faith. Now Jesus added further insights. Then he added, “so I send you”. Jesus made his disciples to be missioners, people sent by him to continue what he had been sent to accomplish, which he then explained. They were to bring his “peace” to the world by forgiving sins through the power of the Holy Spirit. “And when he had said this, he breathed on them, and said to them, ‘Receive the Holy Spirit.’” — Jesus had just made missionaries of his disciples. Now he fulfilled a promise made at least three times during his life, to send the Holy Spirit upon them (Jn. 7: 39; 15: 26; 16: 7–15). These words recall Genesis 2: 7 –“The Lord God formed man of dust from the ground, and breathed into his nostrils the breath of life; and man became a living being.” God’s breath is life–giving. As God gave life to man whom he formed from dust of the earth, now Jesus gave “breath” to his disciples. The word “breath” and “Spirit” are the same. Jesus bestowed the Holy Spirit on his disciples. This was a new creation. The disciples were re–created by new life, the life of the Spirit. Jesus had promised that the Holy Spirit would come down upon the disciples after he would enter into his glory (Jn. 7: 39; 15: 26; 16: 7–15). This was fulfilled when he “breathed on them”. “If you forgive the sins of any, they are forgiven; if you retain the sins of any, they are retained.” — The forgiveness of sins includes reconciliation with God and with other people. Jesus passed on his most consoling power of forgiveness to the disciples who were ordained bishops at the Last Supper on the previous Thursday evening. They represented the Church, the Body of Christ; it is a reconciling Church as Jesus was through his death and resurrection. Note exactly what has been said in this verse: (i) For the second time in seconds or a minute, Jesus repeats his offer of “peace” to his disciples; (ii) He breaths on them with his Holy Spirit ;(iii) this makes them a new creation, bearers of the Spirit of Life; (iv) he gives them the power to forgive sins and make sinners the bearers of the Spirit of Life also. These disciples were the first to receive the gift of forgiveness for lack of faith and deserting Jesus in his agony and death. They had put themselves first, before Jesus as he died to save them. In the following verses Thomas will be seen as he absolutely refused to believe and yet Jesus forgave him, an example to the others if needed. The Council of Trent identified these words as the institution of the Sacrament of Penance for the Forgiveness of Sins. First, when Jesus decided to go to the tomb of Lazarus, the disciples tried to dissuade him because the Jews were planning to stone him. He was adamant and Thomas said to the others, “Let us go also and die with him” (Jn. 11: 5–16). Next Thomas asked Jesus, who had said that he was leaving them, to tell them where he was going as they did not know where and so could not know the way to follow. (Jn. 14: 1–5). Third, his name was mentioned after that of Simon Peter when they were in Galilee and decided to go fishing (Jn. 21: 1–3). 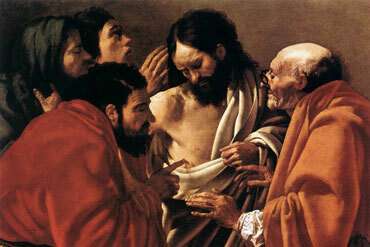 And the fourth mention was the present passage that was responsible for his title of “doubting Thomas”. Thomas was more than a doubter — he was one who refused to believe unless he had empirical facts. It is not known why he was called “the Twin”. “So the other disciples told him, ‘We have seen the Lord.’” — At the beginning of John’s Gospel when Andrew had followed Jesus he told Simon Peter that he had found the Messiah (Jn. 1: 41). Now the disciples proclaim that they had seen the Risen Lord, that is, the Son of God. In this way John proclaimed that Jesus who was crucified was the Messiah and Son of God. This will be repeated at the end of this passage in verses 30 to 31 below. “But he said to them, ‘Unless I see in his hands the print of the nails, and place my finger in the mark of the nails, and place my hand in his side, I will not believe.’” — Thomas was not impressed. In his opinion, what they told him was so ridiculous no one could accept that a dead man could come back to life. So he absolutely refused to believe them. He laid down the conditions that would have to be fulfilled before he would accept that Jesus was alive. “Eight days later, his disciples were again in the house, and Thomas was with them.” — This again was the Sunday, the first day of the week. The disciples had already accepted that on this first day of the week they should assemble together. Ever since for Christians the “first day” or Sunday is more important than the Sabbath. It is the day of resurrection. Sunday was also called “the eighth day”, the day of another new creation. The first creation, as recorded in the beginning of Genesis, took seven days. The “eighth day” was the beginning of a new creation. When Jesus breathed on his disciples, as recorded in verse 22 above, he replicated the action of God who breathed into clay and created the first man. His disciples are to be another creation of new life making people new and different. “The doors were shut, but Jesus came and stood among them, and said, “Peace be with you.’” — These words echo the first appearance of Jesus to the disciples. However, note that on this second appearance we are not told that the reason for the doors being shut was “fear of the Jews”. After the first appearance the disciples believed that they had met Jesus alive and this was the basis of their faith. The disciples were no longer afraid of the Jews. “‘Peace be with you.’” — This is the third occasion in this passage that Jesus uses this greeting. It was very important for him. “Then he said to Thomas, ‘Put your finger here, and see my hands; and put out your hand, and place it in my side.’” — That there is no mention of the wounds in the feet does not mean that Jesus’ feet were not nailed. There were times at crucifixions when the feet were not nailed but tied by rope. However, Luke mentions in two verses that Jesus’ feet were nailed (Lk. 24: 38–39). Jesus used the words spoken by Thomas the previous Sunday evening. These were Thomas’ requirement before he would ‘believe’. Needless to say, Thomas was not insisting on faith requirements but on scientific, worldly and provable facts. “‘do not be faithless, but believing.’” — Thomas had asked for material signs and portents that he could understand and accept personally. Jesus said that those who asked for these were not people of faith but of empirical knowledge. He wanted people of faith, who would accept the word of God and the testimony of God’s appointed messengers. This was a very strong call to belief made by Jesus himself. “My Lord and my God!” — We are not told if Thomas did put his finger and hand into the wounds on Christ’s body. Immediately Jesus spoke to him he proclaimed his magnificent act of faith. This was based on the spoken word of Jesus. He did not exclaim; he asserted. This is the greatest act of faith in the entire bible. What an encouragement for those among us who may have faith–doubts or preconceived ideas! This great act of faith in the divinity of Jesus Christ links with John 1: 1, 14 — “In the beginning was the Word, and the Word was with God, and the Word was God. He was in the beginning with God. And the Word became flesh and dwelt among us, full of grace and truth; we have beheld his glory, glory as of the only Son from the Father.” John’s Gospel begins and ends with this outstanding act of faith. “Now Jesus did many other signs in the presence of the disciples, which are not written in this book;” — John, the author of this Gospel, states that not all the things said and done by Jesus, even in the presence of his disciples as witnesses, were recorded in the book. Indeed an extra chapter, number 21, was added. “but these are written that you may believe that Jesus is the Christ, the Son of God, and that believing you may have life in his name.” — The final verse in chapter 20 sums up the purpose of John’s Gospel. John wrote that his readers might first believe that “Jesus is the Christ, the Son of God”. Jesus the Christ means Jesus the Messiah or Anointed One, promised for centuries in the Old Testament. Second, through this belief John wished his readers to have “life in his name”, meaning ‘life that comes through him’. All people are born as sinners because they bear original sin. They need purification, won for them by Jesus through his death and resurrection. This they receive through baptism. Their new life is eternal life, the life of the Blessed Trinity. Sharing this life means that they are the “children of God”. “To all who did accept him he gave power to become the children of God” (Jn. 1: 11–12). The word “peace” occurs almost innumerable times in the Old Testament and ninety–two in the New Testament. The Jews regarded it as a gift from God. At one stage there was a special altar and it was called “Yahweh is Peace” (Jgs. 6: 24). When someone was at peace it was said that the person was in perfect communion with God. Jesus refers to peace as “my peace” (Jn. 14: 27). The fact that the first words Jesus spoke after his resurrection, “peace be with you”, and repeated twice in this passage, indicates that he had a special reason for stressing this greeting. It was a normal greeting among Jews and Arabs that continues even down to our day. The Apostles used it, including in some of their writings (I Pt. 1: 3; 3 Jn.15; Rm. 1: 7, etc.). The Church adopted this greeting in the Mass after the Lord’s Prayer and before the Breaking of Bread in preparation for Holy Communion. A choice of dismissal is to “Go in peace”. Jesus was the Messiah and when he was born the angles sang “Glory to God in the highest heaven, and peace to men who enjoy his favour”. It is a word associated with the Messiah (Zech. 9: 9; Is. 2: 2–4; 11: 1–9; 48: 18; 60: 17; Hg. 2: 7–9). The Israelites considered peace as above all a spiritual quality. They referred to the Messiah as “The Prince of Peace” (Is. 9: 6). In his kingdom there would be peace without end. This Messianic peace is not a worldly peace which latter can be associated with war, violence and injustice. “Peace cannot be established by violence, peace can never flourish in a climate of terror, intimidation and death. It is Jesus Himself who said: ‘All who take the sword will perish by the sword’ (Mt. 26:52). This is the word of God, and it commands this generation of violent men to desist from hatred and violence and to repent” (Pope St. John Paul II, “Homily at Drogheda”, 29 September 1979). The Messiah’s or Christ’s peace, the same title in different languages, is essentially reconciliation with God, union with him and with all human beings which was brought about by Christ’s death and resurrection (Col. 1: 20). Christians must live in peace with one another (Rm. 12: 18; Eph. 4: 3; Hb. 1: 14). St. Paul lists this peace as a fruit of the Holy Spirit (Gal. 5: 22; Rm. 14: 17l).